Pau Gasol got the best of his friend and fellow Spaniard in last night’s game at Staples Center. The Timberwolves lost, last night. They lost to the Lakers. L.A., as you probably already know, is without veterans Steve Nash, Kobe Bryant, and even Steve Blake and Jordan Farmar. In their stead are Nick Young (The Swaggy Point Guard Edition! ), Xavier Henry, and former Timberwolf, Wesley Johnson. It seemed like a game that the Wolves should win easily. But they didn’t. Corey Brewer missed all 8 of his shot attempts. Alexey Shved made just 1 of his 7. Ricky Rubio and J.J. Barea were the best backcourt scorers last night, shooting a combined 6 for 17. Kevin Love was awesome and Nikola Pekovic was okay. Kevin Martin was mediocre. Playing 2.5 on 5 isn’t going to cut it. Despite a slew of Laker turnovers in the middle of the game, the Wolves played down to their competition and allowed the outcome to be determined by late-game, Pau Gasol hero ball. Some difficult shots went down and that was that. This is the part where I take a deep breath, tell myself that things will be okay and maybe even look at some statistical evidence that paints a prettier picture than Brewer’s spastic dribbling or Rubio’s line-drive jumper. The Wolves have played the league’s third-most difficult schedule. Despite the shooting woes from the field, their offense ranks 13th in the league due to the 21.5 free throws they make per game, which is good for 2nd in the NBA. Their defense is getting worse over time, but still ranks 15th, smack in the middle of the league. The January schedule is favorable and it’s not inconceivable that the Wolves could find themselves over .500 and looking ahead to a 7 or 8 seed in the Western Conference. But that’s far from a guarantee and the team is always one Kevin Love injury away from free falling to the bottom. A central theme of Rick Adelman Interview Answers is that “this team isn’t that good,” and cannot afford to take nights off. Its margin for error in a quest for the postseason is not big. “We’re not the Chicago Bulls that won 72 games,” Adelman once said. I think we can all agree with him on that. Losing at Staples Center to the dinged-up Lakers — or at TD Bank Garden to the rebuilding Celtics as they did last week — does not mean that the Timberwolves are a terrible team. They’re not. But they’re also not a good one. They’re a decidedly average team that ranks smack in the middle of the league in offense, defense, and win-loss record. But the way that their games are decided — hinged on either crafty foul draws against careless defense, or the unsustainable shooting streaks of Brewer and the bench — gives little to no hope that the team has much upside. They’ll usually beat bad teams. They’ll sometimes beat average teams. They’ll rarely beat good teams. They are what they are. Further cementing the Timberwolves status is their payroll and recent roster management. They’re capped out this year and next. If they’re lucky enough to retain Kevin Love beyond 2015, they won’t have much contract flexibility beyond that either. It’s up to the Rubio-Love-Pek trio to carry the load. If they make the playoffs, they give a first rounder in the highly anticipated 2014 Draft to Phoenix as consideration for taking Wes Johnson. (Ouch.) Oh, they also give that pick up if it’s 14th Overall (the last pick in the lottery). That would be the case if the Wolves finish 9th in the West and barely miss the playoffs; a distinct possibility. What a double kick in the nuts that would be. There are two ways of assessing the quality of an NBA basketball team. It can be done in a vacuum, and it can be done in the context of leaguewide competition. In a vaccum, every Timberwolves player is great. (They’re also very tall!) For on-court issues, this is an intrinsically positive viewpoint. Having watched a ton of losing Timberwolves players, I’ve always managed to admire their talents. Al Jefferson couldn’t defend the pick and roll as well as other NBA basketball players, but his low-post repertoire was something to behold. Rashad McCants couldn’t seem to grasp the basics. He was “born to be hated, dying to be loved” and all that jazz. But — that one year anyway — his isolation game was downright filthy. Michael Beasley was of that same kidney. Supercool Beas’s pull-up jumpers were incredibly impressive, as long as you ignored their statistical efficiency compared to other shot types. 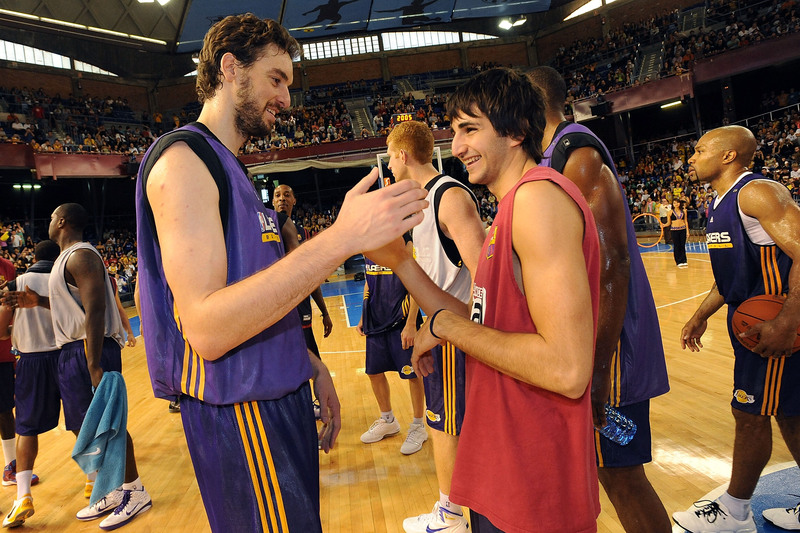 And Darko Milicic– just kidding. I won’t go there. But there is almost always *something* to appreciate on an NBA basketball team. 2) Where are we going? The Wolves are in the middle of the pack and appear to be flatlining. “Average” beats the hell out of what we’ve grown accustomed to in the years following Kevin Garnett’s Minnesota tenure. Most games are competitive. I don’t mean to undersell the importance of the progress made since Rick Adelman and Ricky Rubio began directing the show. But in order to attach meaning to 82 regular season games, fans need to feel like it’s all going somewhere; that it’s for something. And losses like last night’s make that a difficult exercise both emotionally and intellectually. Next up are the Clippers, again at Staples Center, tomorrow night. Until then. It was a disappointing game, especially after they had a day of rest between games. But Love summed it up well when asked after the first quarter what they need to do differently in the second quarter, and he said not play the way we played in the first quarter. Do you think the Wolves still have a chance at making it to the playoffs? Sure, there’s a ton of season left. Whoever fills out the 7 and 8 seeds in the West will probably depend on injuries as much as anything else. Between Kevin Love, Dirk Nowitzki, Ty Lawson, and the already injured Marc Gasol, there are some pretty crucial players whose absence would probably derail their team’s chance. But the Wolves’ll need to scratch and claw their way to an upper-40’s win total, which is the bare minimum for getting in, in the West.